Random House. Hardcover. 1400062853 Item in good condition. Textbooks may not include supplemental items i.e. CDs, access codes etc... . Good. Random House Publishing Group, 2004. Hardcover. Very Good. Disclaimer:A copy that has been read, but remains in excellent condition. Pages are intact and are not marred by notes or highlighting, but may contain a neat previous owner name. The spine remains undamaged. An ex-library book and may have standard library stamps and/or stickers. At ThriftBooks, our motto is: Read More, Spend Less.Dust jacket quality is not guaranteed. Random House. Hardcover. 1400062853 Ships promptly from Texas. . New. 2004. Random House. Hardcover. 1400062853 May have light shelf wear.|1.5 . Good. Random House. Hardcover. 1400062853 Excellent, unmarked copy with little wear and tight binding. We ship in recyclable American-made mailers. 100% money-back guarantee on all orders. . Fine. New York: Random House, 2004. 256 pages. The book shows few signs of use. The top edge of the jacket is lightly worn.. First Edition. Paper Covered Boards. Fine/Very Good. 8vo - over 7¾" - 9¾" tall. Random House. Used - Good. Ships from Reno, NV. Shows some signs of wear, and may have some markings on the inside. 100% Money Back Guarantee. Shipped to over one million happy customers. Your purchase benefits world literacy! Random House. Hardcover. 1400062853 Ships from Tennessee, usually the same or next day. . New. 2004. Random House. Fine+ in Fine dust jacket. 2004. First Edition; First Printing. Hardcover. 1400062853 . Book New. NO notes, names or ANY markings. DJ with 1/2"cut at rear else VF, not price clipped ($22.95) ; 356 pages . New York, NY: Random House. Very Good in Very Good dust jacket. 2004. 1st Printing. Hardcover. 1400062853 . 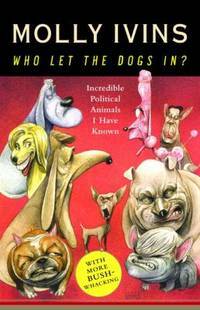 Small 4to 9" - 11" tall; 356 pages; Incredible Political Animals I Have Known; BX199 . Random House. Used - Very Good. Very Good condition. Very Good dust jacket.